As builders, two of our biggest nemesis are leaks and squeaks. To prevent the latter we use the best, time-tested adhesives available. When fastening two parts together, we want them to stay together forever. Over the years we have been really satisfied by the performance of Gorilla Glue products. 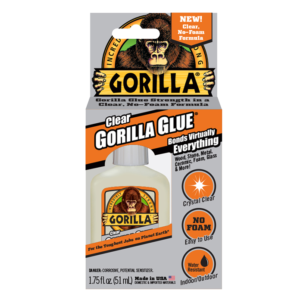 Their Clear Gorilla Glue is no exception and is a nice addition to their vast adhesive offerings – with the same strength of their other products. As the name implies, it is crystal clear, water resistant, can be used for indoor or outdoor projects and will stick to just about anything – wood, stone, metal, ceramic, glass, foam and more. And, it does not foam like other Gorilla Glue products. The handy little 1.75-ounce container makes it especially easy to use on smaller, more intricate repair projects. Plus, you have a little more working time with Clear Gorilla Glue so you can reposition your project before it sets up. It will also fill in small gaps for a nice, uniform finish. We use Gorilla Glue for the toughest jobs on Planet Earth. You, too, can tackle your toughest projects with confidence with Gorilla Glue Clear. A bargain at only $5.99. Learn more and find a stocking retailer at GorillaTough.com.